The Clement Anne Bass is a departure from the Clement Lise bass. 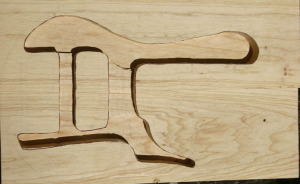 The Lise originally was designed to be a comfortable bass to play when sitting down, so the lower horn was extended towards much further towards the neck than on my previous designs. The design is a so-called “single cut” design, where the upper horn is solid, as on a more classic guitar design. To allow taller players to play the bass comfortably when sitting down, I also incorporated a slight asymmetry in the design, where the neck and strings doesn’t cross the body at the center, but slightly offset towards the upper side of the body. The logic of this is that the strings will be higher up on the instrument, which makes it easier for taller players to find a comfortable seated position. In spite of this, the Lise is still a rater petite instrument, along the Clement tradition of making rather small instruments with a huge sound. 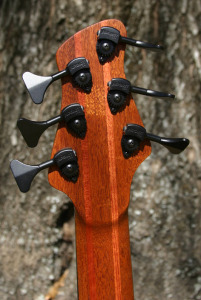 The parent of the Anne bass, the petite singlecut Lise. The owner of the Lise above is very happy with his bass, which has two Nordstrand Dual Coils and a Hipshot Piezo bridge, and loves the acoustic nature of the instrument. In addition, he is also a crazy man, and I wasn’t very surprised when he contacted me about making him a 6-string fretted bass of an even more acoustic nature. He wanted a big bodied bass, where the asymmetrical nature of the Lise was retained, but where the body would be thicker and chambered as much as possible. With this in mind, I took out my Lise body template, and altered it to fit the request. 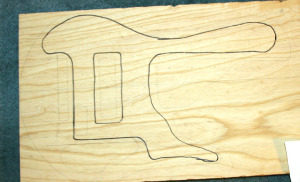 I started by widening it to make it accomodate the 6 strings and still retain the asymmetry of the Lise. Then I added a rounder bottom to it, to give it more of an acoustic vibe. At that time I started hunting for body materials. 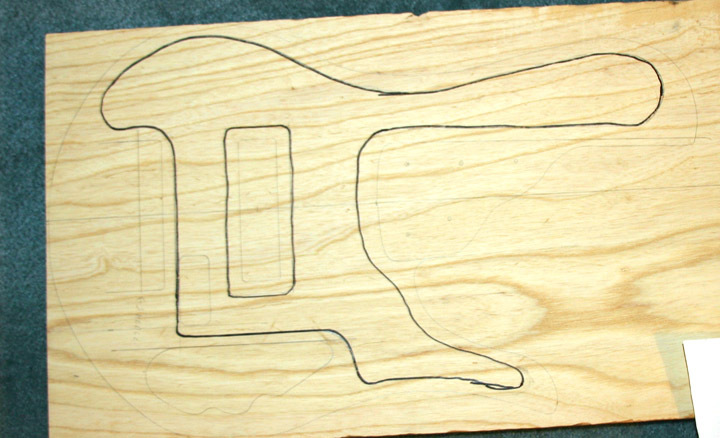 I found a nice and thick swamp ash body blank that suited the purpose in a good way, and I pulled out a spanish cedar top with nice curly figuring in it. The cedar is a very vibrant top wood, and I was positive it would be a good choice of wood for this project. To allow as much room as possible for the chambering of the bass, we decided to go with a single pickup and a piezo bridge. I layed out the parts on the template, and then I made an outline of the chambering that I could do. 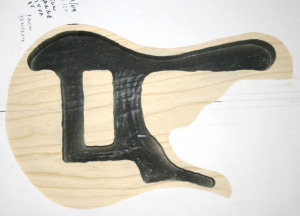 The chambering is extensive, and covers most of the upper half of the bass, all the area between the bridge and the neck except the area left for the pickup. I kept the control cavity separate to allow myself the opportunity of shielding it, but including that, most of the body area is in fact chambered. After chambering it, I painted the interior of the chambers black, to make it possible to make sound holes in the top wood. The control cavity was kept independent of the chamber as I wanted to retain the possibility of shielding it and making it accessible from the back of the body, as usual for an electric bass. 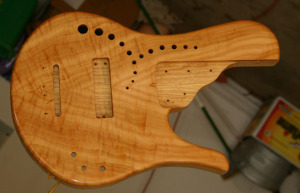 The top wood is a beautiful piece of curly spanish cedar, which is very vibrant. 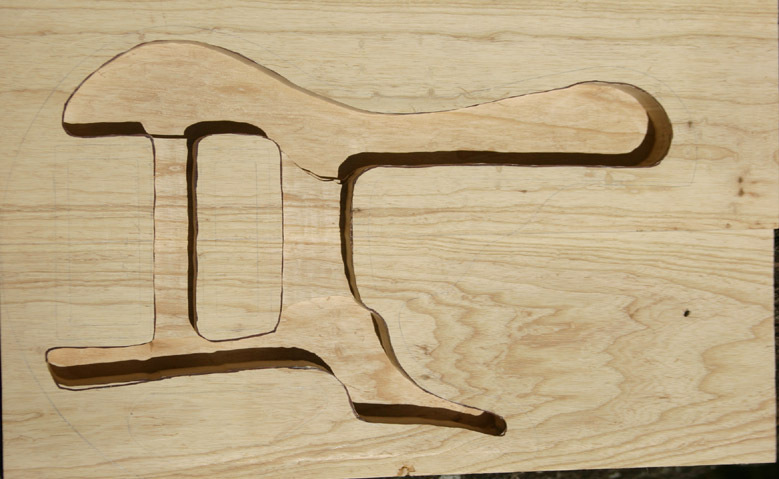 After finishing the bath tub in the swamp ash, I glued the top wood in place, and routed out the neck pocket and control, pickup and bridge cavities, like on a regular solid body. 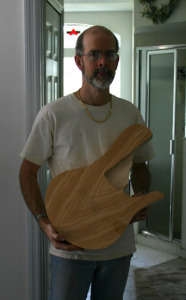 The body received a nice poly satin finish, to protect the wood more than what would be the case with an oil finish. The neck is my standard 6-string neck, and on this bass it is a Mahogany and Bubinga laminated neck, with a Macassar Ebony fingerboard. 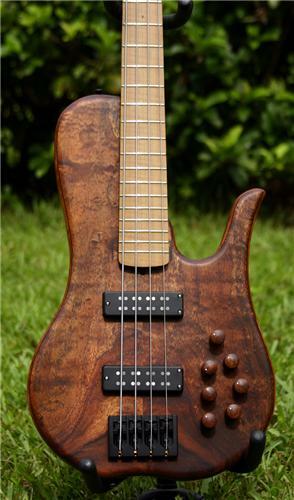 This first edition of the Anne bass is a fretted bass, with a 34″ scale length. 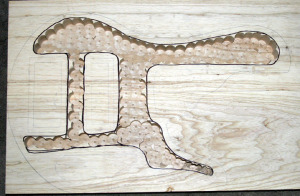 The Anne has it’s top glued in place and the body shape cut out. It’s a big bass! 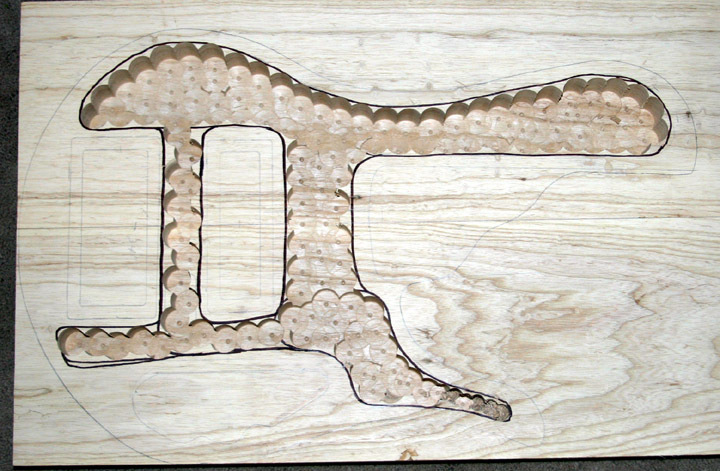 The soundholes are drilled and the body has first coat of poly finish. It really makes the curly cedar stand out! And not only is the Anne a wide bass, it’s also a thick one. 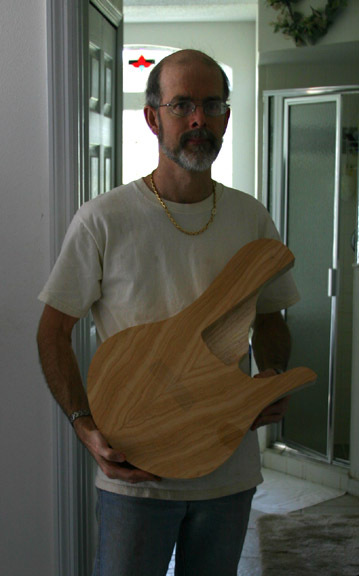 Here it is compared to one of my other basses. The first Anne is finished and ready to ship! No design is good unless it sounds good, and in my humble opinion, we did hit the nail on the head with the Anne super-chamber design. It has a very natural sound, and when the piezo bridge is soloed, it has a very acoustic sound to it. The magnetic still gives it a very good electric sound, so hopefully the owner of this bass will be happy with the flexibility of his new 6-string. There are two great sound clips of this bass on the sound clip page.